Plus addressing (or sub-addressing) allow you to use different versions of your email address. The great thing is that you do not need to do anything. They work right away. It’s a great way to filter incoming messages or when you want to track whether your email address has been transmitted to third parties. What is plus addressing or sub-addressing? 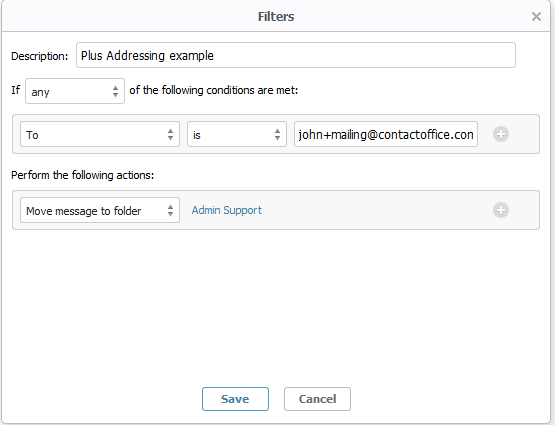 Plus addressing to filter email? First go to the ‘Settings’. There you can configure that all mails sent to john+mailing@contactoffice.com will be moved to folder ‘Admin Support’ as is depicted in the screencapture below. A very useful application of this filtering is for managing mailing lists and site registrations. If you are afraid that your email has been transmitted to a third party you can use plus addressing to track whenever you are required to enter your email on a site. If ever you get a spam to this address you’ll know that your email was transmitted.